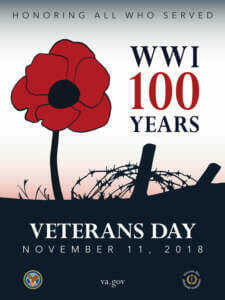 The Dodge City Veteran's Avenue of Flags and the Esquibel Brothers America GI Forum are hosting the 100th celebration of the Armistice that ended the fighting in World War I. Additionally, 2018 is the 20th anniversary of the erection of the Maple Grove Cemetery Veteran's Memorial which replaced the monument hit by lightning in 1938. Please come and help us honor all veterans. Also assisting will be the Howard Gotschall VFW Post 1714 and the Charles Earnest Scott American Legion Post 47 and the associated lady's auxiliaries.